Stop lawn damage fast with the #1 selling mole and gopher bait. 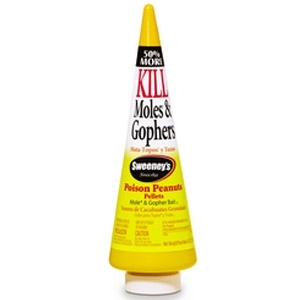 Sweeney's® Poison-Peanuts act as bait to attract moles and gophers. When ingested, the poison peanuts quickly kill the underground rodents. The cleverly designed canister features a cone tip that allows users to punch holes in active tunnel surfaces for easy application of the pellets.